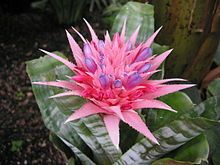 Aechmea fasciata (silver vase, urn plant) is in the bromeliad family, native to Brazil. This plant is probably the best known species in this genus, and it is often grown as a houseplant in temperate areas. It has gained the Royal Horticultural Society's Award of Garden Merit. The plant grows slowly, reaching 30–90 cm (12–35 in) in height, with a spread of up to 60 cm (24 in). It has elliptic–oval-shaped leaves 45–90 cm (18–35 in) long and arranged in a basal rosette pattern. A. fasciata requires partial shade and a well-drained, but moisture-retentive soil. It can also be grown epiphytically, as, for example, with moss around its roots and wired to rough bark. Root rot can be a problem if the soil is too moist.